Time to Meet with Your Congressperson! 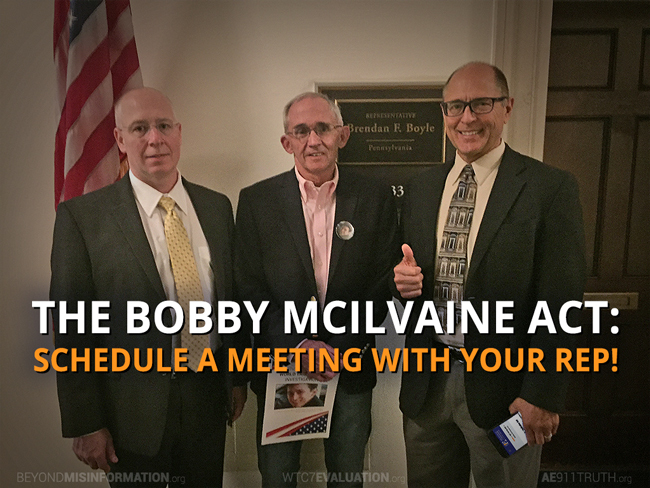 Now that over 1,600 citizens have contacted nearly 500 members of Congress (which we are tracking publicly on our website), the next step in advancing the Bobby McIlvaine Act is for supporters all over the country to meet with their representatives or their staff in their district offices, together with a representative of AE911Truth. Today, we’re setting an ambitious goal of holding meetings with 100 congressional offices by the end of 2017. This is the most effective way to inform our representatives of the need for a new World Trade Center investigation and show Congress that there is genuine, widespread support. In particular, our aim is to meet with at least half of the 61 representatives still in office who sponsored House Resolution 14, introduced in 2015, which called upon President Barack Obama to release the 28 classified pages from the Joint Congressional Inquiry into 9/11. The names of those representatives, along with their parties and districts, are listed below in alphabetical order. If you live in one of these districts, we’re especially counting on you to schedule a meeting. 1) Find your representative and senators. To find your U.S. representative, visit this page and enter your zip code at the top right. If your zip code covers multiple congressional districts, it will ask for your street address. To find your U.S. senators, visit this page and select your state in the dropdown menu. The Bobby McIlvaine World Trade Center Investigation Act is draft legislation that would establish a select committee to reinvestigate the destruction of the World Trade Center. It is named after a 26-year-old who was killed while entering the North Tower and whose father Bob is a driving force behind this effort. Mention that you will be joined by an Architects & Engineers for 9/11 Truth representative and, most importantly, don’t forget to mention that you’re a constituent from that district. 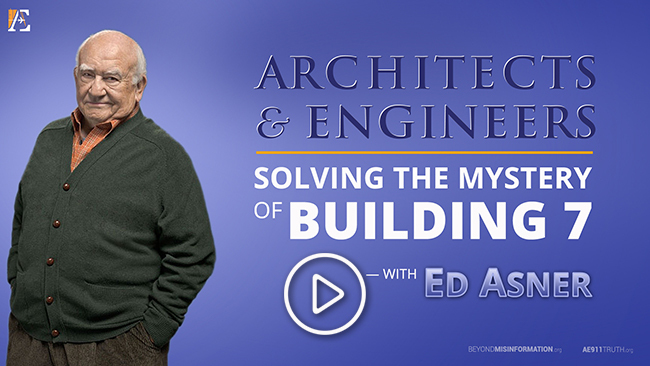 3) Email us at Congress@AE911Truth.org once you’ve requested a meeting, and we will try to arrange for an architect, engineer, or AE911Truth staff member in your area to join you (though we can’t guarantee that we’ll have someone available where you live). 4) Email us again once your meeting has been scheduled. Congressional offices tend to be very receptive to constituents who request meetings, but keep in mind that it may take time for your meeting to be scheduled. Expect the meeting to last no longer than half an hour. Once we hear from you, we will provide you with an MP4 of Solving the Mystery of WTC 7 to play during the meeting, along with other materials and any additional assistance you need. Thank you in advance for stepping up to the plate. Although we all know that our efforts may not bear fruit immediately, don’t forget that one-on-one dialogue with members of Congress is the surest way to win allies who will eventually have the courage to stand up when the time is right.